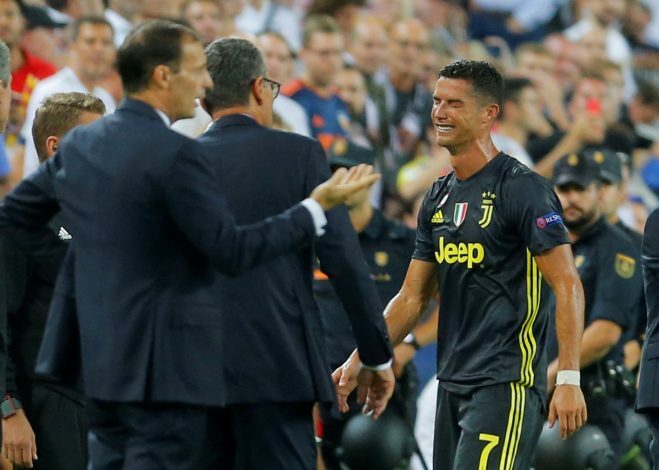 Cristiano Ronaldo’s return to Spain ended on a sour note after he received a straight red card in the UEFA Champions League group stage game between Juventus and Valencia. This was Ronaldo’s first red card in the competition’s history, and it came in his 154th match. The 5-time Champions League winner, who scored a brace in the weekend in the Serie A, saw his night end on a disastrous note just in the 29th minute. Juventus still won the match 2-0 though, after Miralem Pjanic struck two penalties to see his side take away all three points. Ronaldo was seen clashing with Valencia’s Jeison Murillo, and replays showed a slight tackle on the latter as he fell down to the pitch. Ronaldo then seemed to grab the player’s hair, perhaps signalling him to get up. Jeison retaliated and the official on the backline signalled the referee, who showed the Portuguese a straight red. The former Manchester United and Real Madrid talisman was left in disbelief, and was also seen crying. He also went on to speak the the referee before marching off the pitch. According to a report in the Mirror, the Portuguese captain was seen saying “I did not do anything,” but that didn’t result in anything, as the decision stayed. STAT: Cristiano Ronaldo becomes the first player in history to start crying in the Champions League with three different clubs. Ronaldo could now miss three games, including Juve’s away tie against Manchester United at Old Trafford. The Italian giants are expected to appeal against the decision, and we will have to wait and see if the ban gets overturned or not.